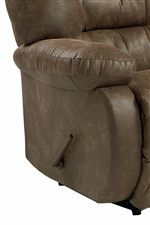 The Maddox Reclining Living Room Group by Best Home Furnishings at Furniture Discount Warehouse TM in the Crystal Lake, Cary, Algonquin area. Product availability may vary. Contact us for the most current availability on this product. Fabric Options Over 700 different color styles in fabric and leather upholstery. Arm Type Plush pillow arms seen on each piece. Create a room in your home that makes relaxation a top priority with the Maddox motion upholstery collection. 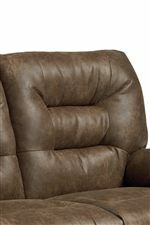 Comprised of loveseats, recliners, and motion sofas, each item is designed with smart function options so you can find the piece best suited for you and your home. Fully padded chaises bring you comfort that supports you from your neck to your toes, with a plump channel-tufted back and plush pillow arms to ensure that no part of your body goes without comfort. The loveseat is available with our without the center console, which allows you to decide if you'd rather get close to someone during a romantic movie or recreate that movie theater experience in your home with a storage spot for your snacks or remotes and two attached cup holders. Designed with amazing comfort and function in mind, this collection has everything you need for your perfect entertainment area- claim your spot fast, everyone is sure to love the wonderful support and style of the casual Maddox collection. The Maddox collection is a great option if you are looking for Casual furniture in the Crystal Lake, Cary, Algonquin area. Browse other items in the Maddox collection from Furniture Discount Warehouse TM in the Crystal Lake, Cary, Algonquin area.